As most of you who frequent this website know, I’ve traveled to Vietnam for a second wedding celebration joining my wife and I as a couple. The centerpiece of this Vietnam visit is this wedding, so it would probably be a terrible move for me, as a writer, to not cover it in as much detail as possible. I admit, I don’t have many photos of the day, as it was a rather busy time for me with lots of eyes watching. I do however have some thoughts and experiences to run through with you all, and I’ll try and use others’ photos to help illustrate it as well as possible. Let’s begin, at the beginning. The Vietnamese wedding is, traditionally, a much different ceremony all together. It’s typically a huge deal, of course, but it is celebrated in a different way, and the focus is also primarily different. 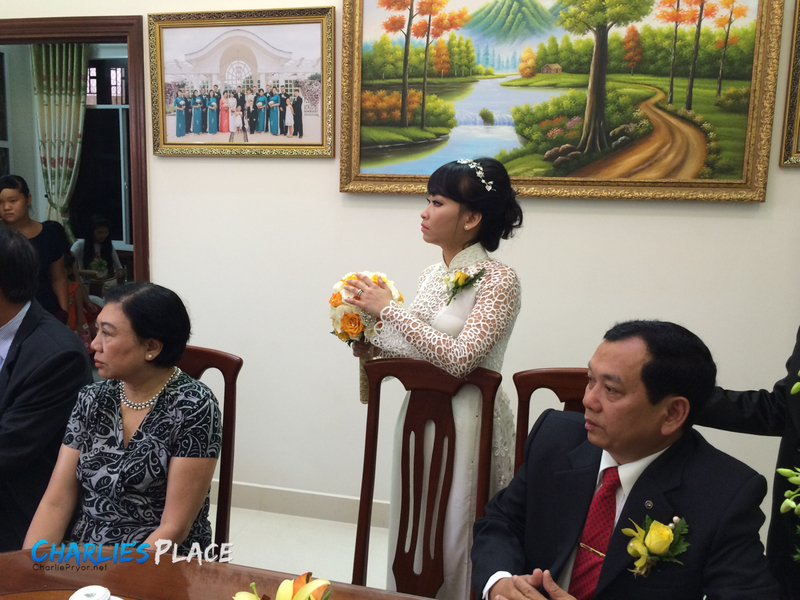 If you haven’t read my brief overview of the Vietnamese wedding ceremony here, you should do so now before continuing this story. It will provide some background that will be essential to understanding the differences in cultures, and the differences that occurred for our wedding in relation to what it normally is like here in this country. I’m not going to spend a lot of time covering the way it normally is here. Instead, I’ll just cover what happened, and allow you to see the differences for yourself with that article. Don’t feel shy. Click the link, read the other one, and then come back here. I’ll make it open a new window or tab for your convenience. We’ll continue after the break. Okay, so now you’ve either gotten yourself caught up on the way weddings normally go here, as a summary, or you had no interest in such things, and moved down here anyways. Either way, welcome to right here and now. Let’s start things off with the ceremony itself, which is treated as less about the couple, and more about the union of two families. The day started in a similar fashion to in America: with everyone running around rushing for last minute details. I did not, however, have to hide myself from the bride this time around, as it was well known and accepted that were were indeed already married in the United States. The ceremony location was actually the home itself, which is similar to the traditional wedding here, except ours was held at the bride’s family home, instead of the groom. I do not have a family home here, so clearly that had to be changed. I rented a tux, which was a unique experience in and of itself, and got myself dressed up and looking nice after helping the family move some furniture around in preparation for the ceremony. Many people were already here before I began getting ready, and all of them loved to call me a “handsome man” over and over again. Don’t get me wrong, I don’t think I’m necessarily ugly, but to put it mildly: I don’t think I’ve ever felt as good in a suit before. The amount of compliments and looks was awesome, and I imagine this is a similar feeling to what the typical bride feels on her wedding day. Like they are the most attractive person in the room. Now, I’ll backtrack slightly. I said earlier that I was helping the family move furniture. The home was the place for the ceremony, and the way furniture is normally arranged in the home wasn’t suitable for this engagement. It called for a bit of a remodel and when I woke up on the morning of, the living area in the front of the home had already been cleared out, leaving what was essentially an open room in its place. This open area was quickly transformed into a place for people to sit, eat, drink, and for the ceremony to take place. The kitchen table was even disassembled and put back together out front for the occasion. Flowers were everywhere too. More flowers than I’ve seen in a home before for sure. Most were fresh flowers brought in that day, but the flowers around the giant archway in the front of the home were a couple of days old (they usually are brand new and fresh, but we were already married before, so it didn’t matter). The archway (which you’ll see in photos to come) was constructed for the ceremony in the home, and was actually transported to the home by one guy on a motorbike, in one single trip. It was brought in pieces, and assembled on location. Just learning that alone made me impressed with it, simply because I can’t imagine the guy being able to haul it all with one scooter trip, given the sheer amount of materials involved, and the weight of them. It’s not exactly a light piece. For dressings, My father and brothers all wore a similar tuxedo as I did, with me having an ivory colored vest and tie to their black. My grandmother brought a lovely dress to wear, and both my mother and mother-in-law were dressed in traditional Ao Dai, which were custom made specifically for them. You can read more about Ao Dai and my mother getting one if you’d like by reading this article as well. There were dozens of compliments expressed towards her in an ao dai, and overall I think she rather enjoyed wearing it. It’s fairly rare to see a white woman in this type of clothing, especially one from America. The response she received regarding it was very warm and welcoming. Hang, my beautiful bride, was more beautiful than ever of course, wearing the same wedding ao dai (and later a dress) that she wore for the wedding in the United States. As more and more people began to show up, the already limited space within the home became rather restrictive, especially for us ‘larger people.’ I spent the vast majority of my time in what used to be the dining room area before the table was moved, simply because it offered a space that was open enough for my family and I to be comfortable waiting for the day to begin. It was also near a fan, and right next to the bedroom that we got dressed in, which had air conditioning. The ceremony was scheduled to begin at 3:30pm, and as the time rapidly approached, more and more people began showing up. The weather was cool in comparison to what Vietnam is normally like, but still very warm for what my family is used to standing in, especially in suits. We drank plenty of water to help, but a sweaty brow was simply an inevitability. When it was time, we were summoned out into the common area to take our places for the ceremony to begin. My family sat on the right, and Hang’s on the left. It all seemed more like a simply gathering of family and friends around a set of tables than a wedding. The only real “wedding” part about it, in my narrow view, was the suits we were wearing. I didn’t know what to expect, since this was already much different than usual. My family took their seats, and as I took my place standing behind my father, my confusion and nerves began to subside, and I actually started feeling slightly more comfortable with being the center of attention in an entirely unfamiliar setting… kinda. Next story How Can People Think It’s Cold In Hanoi, Vietnam? Previous story Five Cavities Filled In Vietnam For Less Than $90, Without Insurance. What an amazing story and detail to the wedding. Thanks for sharing. Your mom has such a great voice. Thanks! She does have a great voice! – Notice how people brought her stuff as well. In Vietnam, if you like the singer, you bring him/her stuff (like flowers) directly on the stage as a sign of gratitude and respect. They wanted her to keep singing too, but we never told her that. Once is enough, so she can still enjoy the party without worrying about a performance. Teresa, I don't know how you did it with the music you had to follow but you pulled it off!! Haha!! And people bringing you flowers was a nice touch. A very honest commentary. Some of it, especially the last page…….reception part 2……made me laugh. Sorry you had to go so long without food and glad you didn't pass out! Haha!